Fouad Namouni, MD, from Bristol-Myers Squibb Co., which makes the PD-1–targeted nivolumab (Opdivo). Kevin Chin, MD, from EMD Serono, which makes the PD-L1–targeted avelumab (Bavencio). Hesham A. Abdullah, MD, DRSc, from AstraZeneca Pharmaceuticals LP, which makes the PD-1–targeted durvalumab (Imfinzi). Israel Lowy, MD, PhD, from Regeneron Pharmaceuticals Inc., which makes the PD-1–targeted cemiplimab-rwlc. Scot W. Ebbinghaus, MD, from Merck Research Laboratories, which makes the PD-1–targeted pembrolizumab (Keytruda). Alan B. Sandler, MD, from Genentech, which makes the PD-L1–targeted atezolizumab (Tecentriq). Joining the industry representatives on stage was Pazdur’s colleague Marc Theoret, MD. Immunotherapeutics that target the proteins PD-1 or PD-L1 are part of a class of cancer treatments called immune checkpoint inhibitors. PD-1 is an immune checkpoint protein that acts as a brake on the natural cancer-fighting ability of immune cells called T cells when it is engaged by PD-L1 or PD-L2. By targeting PD-1 or PD-L1, these immunotherapeutics disrupt the braking system, allowing the T cells to carry out their natural function and destroy cancer cells. 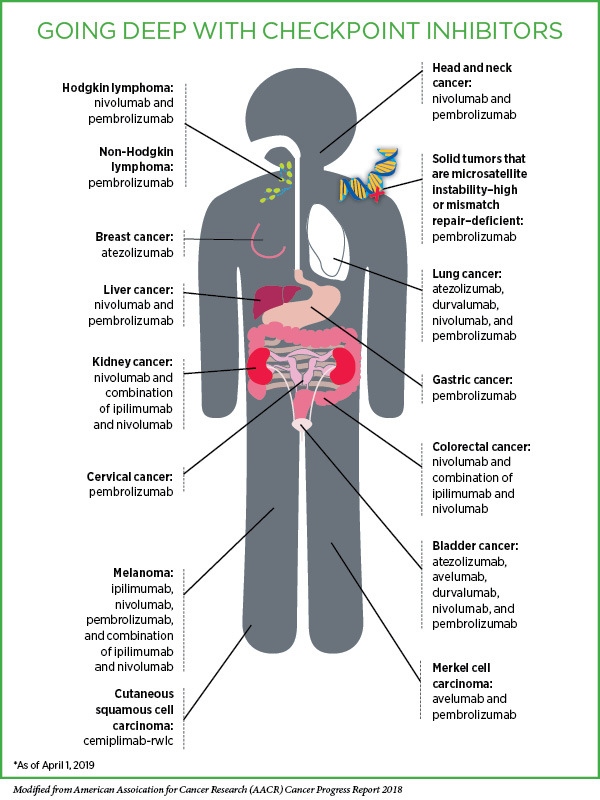 At the time of the session, there were six FDA-approved immune checkpoint inhibitors that target PD-1 or PD-L1, each from a different biopharmaceutical company, and many more in development. 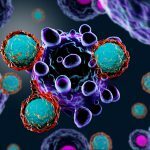 These immunotherapeutics have exploded into the cancer treatment arena in the past five years because they have yielded remarkable and durable responses for patients with an increasingly diverse array of cancer types. The high level of activity in this area is highlighted by the fact that these immunotherapeutics accounted for 21 percent of FDA’s oncology drug approvals in 2018, Pazdur noted. In response to the first question, most of the participants agreed that while there are clear differentiators between the therapeutics, the safety and clinical activity tend to be more similar than different. However, Lowy (whose company has a PD-1–targeted therapeutic) countered that he thinks “there is a big difference in the classes, PD-1s versus PD-L1s.” He discussed some biological and clinical reasons he believes this, concluding that “between the classes, if I had to choose, I would prefer PD-1. Among the PD-1 blockers, I don’t know that there’s really any major difference,” he added. Unsurprisingly, Sandler and Chin, who both work for companies with PD-L1–targeted therapeutics, disagreed. Chin suggested that a head-to-head trial would be the only way to really address this, although everyone admitted that it is unlikely that such a trial will ever be conducted. The industry representatives were unanimous in their response to the second question: They all agreed that there are not too many PD-1/PD-L1–targeted therapeutics. 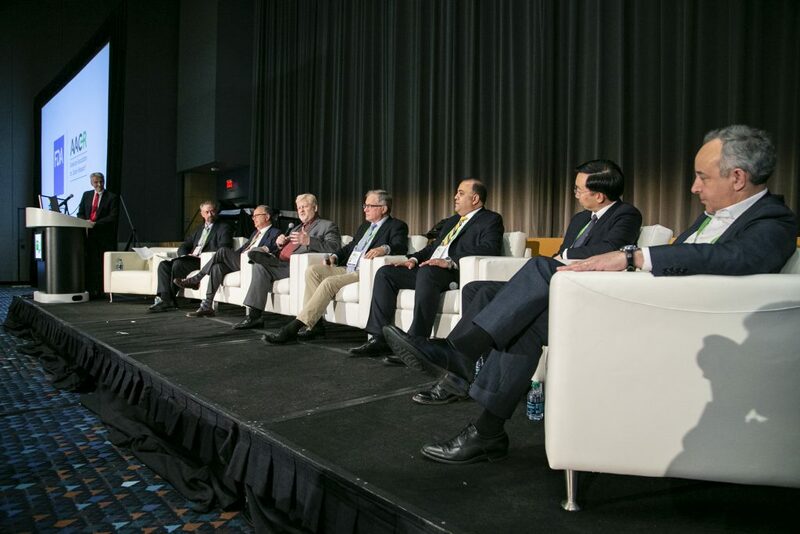 The point that they all conveyed was that competition has improved patient access to what has turned out to be a revolutionary group of new cancer treatments. Abdullah did say, however, that in his opinion, there is probably no need for any more PD-1/PD-L1–targeted therapeutics of the same generation. Rather, we need “next-generation types of molecules” that have enhanced safety and efficacy, and that address unmet clinical needs, he explained. Pazdur noted that there are positives to having multiple similar therapeutics, such as having alternative treatment choices in the case that one therapeutic is in short supply. “But there are some potential negative issues of having multiple drugs with multiple confirmatory studies, and one thing that the FDA has many times asked sponsors to do is to collaborate on studies using common controls, etc.,” he said. As an example of this, Pazdur said that the FDA was disappointed in the lack of collaboration that occurred in the development of PD-1/PD-L1–targeted therapeutics as a treatment for renal cell carcinoma, “multiple trials being done against Sutent [the standard of care], obviously a very wasteful approach to developing a drug without any collaboration here between the companies. Our point of view from a regulatory agency is that patients … are not a company’s resource, they are a global resource to answer important questions,” he chided the industry representatives. Lowy responded that it is unrealistic to expect the companies to proactively come together to design and conduct a clinical trial with a single control arm because that is not what they are set up to do. He suggested that the only way to make this happen would be if there was an external party driving this. Ebbinghaus noted that the likelihood of the companies collaborating probably depends on the topic. “I think there are things in the precompetitive space where you can collaborate,” he said. Namouni agreed. Pharmacodiagnostics is one of these spaces, he said, as the conversation turned to the Blueprint proposal developed by four of the companies (Bristol-Myers Squibb , Merck , AstraZeneca, and Genentech.) and two diagnostic companies (Agilent Technologies Inc./Dako Corp. and Roche/Ventana Medical Systems Inc.). Unveiled at the FDA-AACR-ASCO Complexities in Personalized Medicine: Harmonizing Companion Diagnostics across a Class of Targeted Therapies workshop in March 2015, the goal of the proposal was to characterize the performance of the various PD-1/PD-L1 companion diagnostic tests for non–small cell lung cancer from the two diagnostic companies. Sandler said, “Blueprint was a great idea.” However, it did not have clinical efficacy data, so it did not show which is the best, he added. Theoret and Pazdur acknowledged the issues with harmonizing biomarker assays after they have already been developed and marketed, but they wanted to know whether the Blueprint experience had informed the development of the next-generation of biomarker assays. “Can we have a more harmonized approach to other biomarker development?” Pazdur asked, explaining that it would help oncologists and patients. Ebbinghaus pointed to the fact that there are collaborative efforts underway to harmonize use of tumor mutational burden as a potential biomarker for PD-1/PD-L1–targeted therapeutics. Sandler added that he sees the biomarker space as an area in which the companies can work together because patients, physicians, and companies would all benefit from having a uniform assay to measure the biomarker. Pazdur and Theoret concluded that the FDA has learned a lot in the past five or six years through the experience of regulating the development of the PD-1/PD-L1–targeted therapeutics. “It really pushed the agency forward,” Theoret said. Both men also thanked the industry representatives for participating. “Clearly this has been a very transformative class [of drugs] and this is why Rick brought everyone up here. We really appreciate you … being fully transparent with your answers,” said Theoret. “I had a great time, I hope you guys did too,” declared Pazdur.